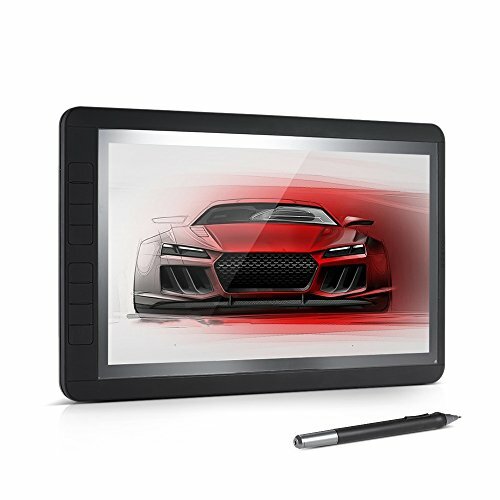 BOSTO 13HD graphic drawing tablet has 13" IPS screen, 1920 * 1080 high resolution, 16.7M abundant color depth, 700:1 contrast ratio, 250cd/㎡ brightness, 178°viewing angle. 2048 pressure level drawing pen, 2.5ms fast response rate, max. 25mm reading height - highly sensitive - highly advanced to offer you enjoyable experience. The rechargeable pen can work for 5hrs even if it is charged for 3min. Comes with 20pcs pen refill and a remover, a glove to avoid screen smudge, a cleaning cloth. System Compatibility: For Windows/Mac OS,and software such as for Ai/PS/Painter/BOSTO/Pr/Ae/Lr/FI/sai & etc. Item Size: 35.7 * 22.5 * 1.4cm / 14.1 * 8.9 * 0.6"
Package Size: 41 * 26.7 * 5.5cm / 16.1 * 10.5 * 2.2"
13" IPS screen, 1920 * 1080 high resolution, 16.7M abundant color depth, 700:1 contrast ratio, 250cd/㎡ brightness, 178° viewing angle, clearly and vividly display your artwork. 2048 pressure level drawing pen, 2.5ms fast response rate, max. 25mm reading height - highly sensitive, offer fluid and fine drawing experience and largely reduce long time drawing fatigue. The pen has built-in intelligent charging chipset: 3min charge will offer 5h service time; auto stand-by if not using. HD & Type-C 2 in 1 connecting cable, improve the transmission speed by 50%, put an end to the embarrassing drawing delay. The screen is protected by the 1.0mm highly crystal frosted screen film - prepared for frequent drawing. Non-slip design back, comes with a height adjustable support for a better drawing angle. Comes with 20pcs pen refill and a remover, a glove to avoid screen smudge, a cleaning cloth.Comes with a 8GB USB dish with relative set-up driver.Compact and lightweight, with a portable carrying bag, great for outdoor drawing. Sullivans Home Hobby Adjustable Height Foldable Table, 59 x 35.8"